An antiparkinson medication is a type of drug which is intended to treat and relieve the symptoms of Parkinson''s disease. Most of these agents act by either increasing dopamine activity or reducing acetylcholine activity in the central nervous system. 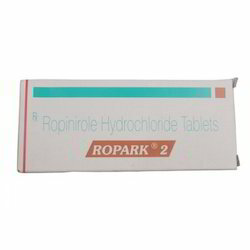 Ropark 2 mg tablet is used to treat moderate to severe restless legs syndrome (crawling or bubbling sensation causing irresistible leg movements) of unknown origin. Looking for Anti Parkinson Drugs ?